Misfit announced its first smartwatch at the start of this year, but it seems it won't be as great as it initially sounded. The Misfit Vapor was originally announced with a built-in GPS so you could go running without having to take your phone. A new note from the fitness tracking company has said it will now offer connected GPS instead, which relies on being tethered to a nearby phone. In an Instagram comment on its own profile, Misfit wrote "The Vapor will now offer connected GPS - you can view your distance, steps, and calories burned on your wrist when you go for a run. "Additionally, you can track your route, view step-by-step directions on a map, and collect data when your phone is paired and near you." 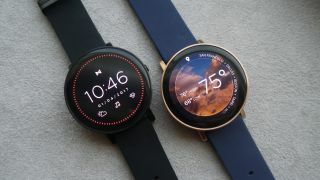 It's a shame that Misfit's first smartwatch won't come with built-in GPS so you can use it without a smartphone, but the company may have switched to connected GPS to save on battery life of the wearable or keep the cost down. As long as none of the other spec of the watch changes, the Misfit Vapor is expected to run Android Wear 2.0 and offer a smartwatch experience that's focused on fitness based features.